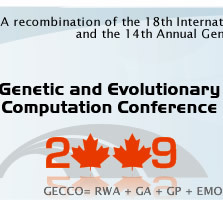 The Evolutionary Computation in Practice (ECP) track at Genetic and Evolutionary Computation Conference (GECCO) is dedicated to the discussion of issues related to practical application of Evolutionary Computation. For the past four years, members from industry, governmental agencies and other public sectors have participated in presentations and discussions describing how evolution-related technologies are being used to solve real-world problems. Moreover, subjects on bridging academic training and real-world usage are also addressed. The applied technology can be any evolution-related algorithms or its hybrid with other techniques. For a list of evolution-related technologies, please refer to GECCO Tracks. Examples of other technologies are agent-based modeling, simulated annealing, tabu search, neural networks, fuzzy logic, statistical modeling, and decision trees. Managing an EC project for success. Many of the most important factors in an EC project's success have nothing to do with the technology. In this session, experienced project managers describe how to identify, design, manage, and promote a successful EC project. Emerging Technologies. What are the new EC technologies that you can use in your own organization? What do you need to know in order to use them? This session includes three discussions of new technologies and the best way to apply them. EC in Design. Three experts from industry describe EC projects in which evolutionary techniques were critical in designing cutting-edge products. EC in Statistics and EA Consultancy. How can EC techniques and classical statistics work together? How can EC improve on statistical results? How can you use these techniques in the real world? This session addresses these important questions. Getting a job in Evolutionary Computation: What To Do and What Not To Do. This session is intended to help students place themselves in the most positive position for getting employment in the evolutionary computation field. This is the fourth year time we have included this session. We have found that many of the points made by speakers from academia and industry are both surprising and helpful to students. Ask The Experts: EC Questions From The Audience. This session is improvisational. A panel of experts in EC applications responds to presentations from the session attendees. After a problem is described, the experts respond with their assessment of its suitability for EC solution and their suggestions for solving the problem. You may wish to attend this session to gain free consulting by describing a problem of your own, or to watch the fun as real experts are presented with real problems and think on their feet. The Invitation for Abstract Submission solicited a one- to two-page abstract for review. Are these abstracts in lieu of, or in addition to, submission of a full-length paper to the GECCO conference itself? - ECP abstracts review is independent of GECCO papers review. Unlike the main conference which only accepts papers with high technical quality, ECP presentations place emphasis on deploying solutions for real-world problems. Depending on the application area of the work, the abstract is reviewed by the session organizer, who decides if the work suits the ECP theme and invite the authors to present the work. I've already prepared a 6-page paper. Would submission of this paper (rather than an abstract) be acceptable? 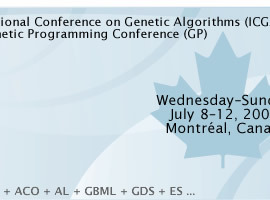 Will abstracts accepted for the ECP track be published as full papers (i.e., 8-10 pages) in the GECCO Proceedings? - No. Since ECP abstracts are not reviewed the same way as that of GECCO papers, they will not be published in the GECCO Proceedings. Previously, we either have published ECP abstracts/papers in a separate volume or published the power point presentations with GECCO Workshop Proceedings in a CD. We have not decided how we will handle publications this year. What is the relationship between the ECP track and the Real World Applications track, if any? - The Real-World Applications track at GECCO accepts papers with high technical quality like that of the other GECCO track papers. The ECP track is generally suitable for researchers and managers from industry, who have less time to spend writing a complete technical paper but still would like to relate a significant success in using the technology to solve a real-world problem. Therefore, if academic publication is important to you, we suggest that you submit your papers to the GECCO real-world applications track.